The provincial government, Justice Minister Andrew Swan and those sitting on the provincial domestic violence Death Review Committee must turn their minds to investigating what happened to Sandi-Lynn Malcolm. Nothing short of a full and frank examination into how a young aboriginal girl can be serially abused by her ex-partner on a small reserve — only to end up brutally killed by his hands, will suffice. It’s my view the public should be protesting — as Malcolm’s family and friends have done — to bring attention to her case in hopes of rooting out others like it before it’s too late. What happened to this girl should not have happened and we should be sickened by it. She lived in an isolated environment that had few resources or opportunities for intervention. Warning signs — including those expressed through her own words to police — that something awful was going to happen weren’t heeded to the degree they should have. He repaid her undeserved trust with unspeakable violence. She was only 17 years old, though. A kid. We can’t lose sight of this. “There. 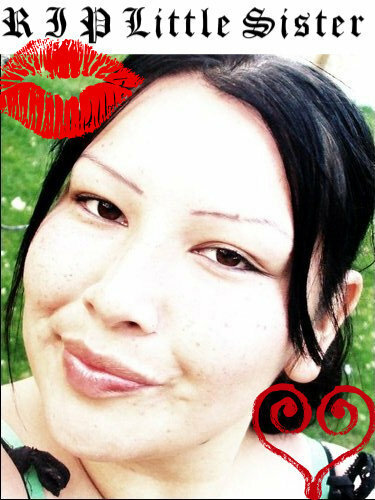 I done what had to be done.” — Ronald Racette Jr.
On the night of Jan. 30, 2010 RCMP who police the Ebb and Flow community got a call from Malcolm’s mother, saying her teen daughter was covered with cuts and had black eyes. Sandi-Lynn gives an official statement, in which she alleges her ex-boyfriend, Ronald Racette Jr., 19, had brutally assaulted her at his father’s home. He punched her, hit her with a lamp, whipped her with the lamp’s cord and then tried to choke her with it. A check of Racette’s record on CPIC would have alerted police to the fact of his prior domestic-abuse history. “I should just kill you,” she reported Racette Jr. as telling her. There were no other witnesses, she told police, who photographed her bruises and cuts. Less than two weeks later, on Feb. 8, Sandi-Lynn picks up the phone wanting to report the violence Racette Jr. put her through a day prior . She gives another statement: Sandi-Lynn, covered in bruises, tells RCMP that her vow to stay away from Racette Jr. collapsed when he phoned her, pitifully saying he hadn’t eaten in two days. Sandi-Lynn brings Racette Jr. something to eat. They were “getting along fine,” she said. But when she said she had to go to work on her resume — she hoped to get a job as a cashier in a store — he grew angry. While out for a walk, Sandi-Lynn was made to run through deep snow, was knocked down and kicked and pummelled while being accused of being unfaithful while he was in jail. “Everybody had told her not to take him back because the next time, he’ll kill you, but she didn’t listen,” court heard of her police statement. Sandi-Lynn’s survival skills kicked in. She offset his volatility by “pretending to love him” — putting on a “big front” in hopes of getting away from him alive. He kept beating her, and made her stay outside, shoeless, in the freezing cold. “She said she felt like she was being kept hostage or something,” RCMP heard. Racette Jr. wasn’t drinking, Sandi-Lynn said. After giving her statement, RCMP set out to look for him. At the second community home they came to, Racette Jr. is seen fleeing into some bushes. Cops chased him on foot but couldn’t catch up. A warrant issues but he’s not caught. He’d re-emerge just over two weeks later for his last night of freedom. A recounting of Sandi-Lynn’s last hours were presented to the court through witness testimony from people who were around Sandi-Lynn in her last hours and minutes. On the evening of Feb. 26, Sandi-Lynn and a group of girlfriends scored a 30-pack of beer, but didn’t set about drinking heavily. She used the phone at one point, and reported the party was happening at Racette Jr.’s dad’s home. It’s believed she was talking to Racette Jr. in this call. He turned up not long after. Instead of driving directly to the party, Racette Jr. took a route past a local cemetery and stopped the vehicle. “This is where we are all going to end up,” he said. Once at the party, it didn’t take long for Racette Jr. to become irate. Sandi-Lynn refused him a request to go alone with him to another room. Not long after, Sandi-Lynn and another friend were horsing around, just being girls. “She’s my girl now,” the friend joked to Racette Jr.
Racette Jr. responds by punching the friend in the face four times, an assault only stopped after others intervened to pull him off. He goes outside for a few moments. Returns. Another request of Sandi-Lynn is made for the two to be alone. Another refusal from her. This. The last straw. He tosses an ashtray in her direction and begins grabbing knives. “A number of people went and hid in Ronald Sr.’s bedroom because they feared something terrible was going to happen,” Justice Midwinter was told. They had no idea how awful it was going to get. Sandi-Lynn and another woman who had come to collect her young son from the home fled to a bathroom. Another witness reported seeing a “trail of knives” leading to the bathroom door. I won’t recount what happens next, other than to say a jealous and enraged Racette Jr. committed acts of such brutal and extreme violence on Sandi-Lynn that hearing the extent of her injuries was truly jarring. 47 stab wounds don’t even amount to half of the total number of injuries a pathologist totalled up. Dr. Charles Littman noted 105 “incidents of trauma” on her. One of Sandi-Lynn’s friends tried to stop the attack by stabbing Racette Jr. in the back as he murdered the teen. It only served to anger him more. He made his way to his father’s bedroom — they unlocked the door to let him in — where people cowered in fear. Children had to be out out the window for fear of their safety. Racette Jr. didn’t reply. He went back to the bathroom where Sandi-Lynn was and turned on the shower. Efforts to revive Sandi-Lynn didn’t work. It took 45 minutes for the ambulance to arrive. Police caught up with Racette Jr. at his aunt’s home, where he was wrapped in a blanket, being comforted by a relative. There was little defence lawyer Todd Bourcier could say in defence of what Racette Jr. did — acts the now 21-year-old pleaded guilty to doing. But Bourcier raised some credible points about the lack of intervention and other resources in the community for domestic abusers and abuse victims alike. The nearest women’s shelter from Ebb and Flow (on-reserve population of 1,200 or so) is in Dauphin, a distance of 50 kilometres away. Options for counselling for men is limited, even to address what he termed the “surface concerns” for offenders with histories of abusing their partners. And certainly nothing to address Racette Jr.’s specific needs as an angry, jealous, ill-educated, booze-and-drug abusing violent offender of a horrible background, now convicted murderer. There’s one band constable on reserve, and the nearest RCMP detachment is in St. Rose du Lac, about 35 or 40 kilometres away, according to an online description of the band’s operations. Despite the small number of people living in the community, between December, January and February, cops responded to 465 service calls, 78 of them regarding violence, Bourcier said. It goes without saying Sandi-Lynn’s family and friends have been wrecked by not just her death, but also how she died. She was just weeks away from her 18th birthday. 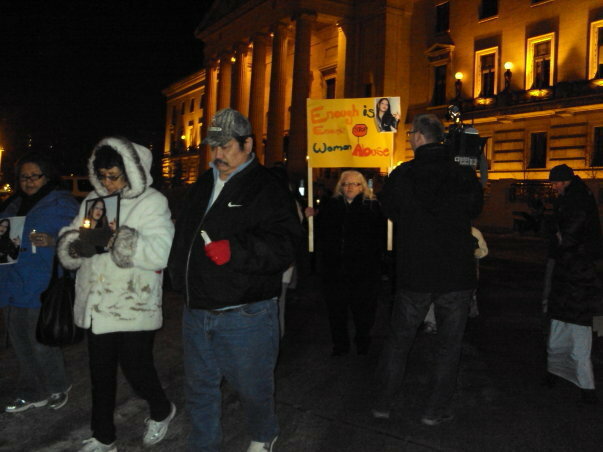 I was there at the Manitoba Legislature a few days after Racette Jr. was charged with her murder when Sandi-Lynn’s relatives and friends travelled the 300 k.m. into the city to hold a candlelit vigil and peaceful protest to condemn domestic violence. “Our little reserve is not a war zone. Things like this should not happen,” her dad, Kingsley Malcolm, told me at the time. There were no resources in the community for Mr. Racette to access … and I have to deal with a vicious attack unprovoked by anything the victim did. Would it be too much of a stretch to believe that the simply sad domestic-violence resource situation in Ebb and Flow is markedly different from countless other isolated Manitoba communities out there? Today, using the only tiny power I have — this forum — I’m calling on the Manitoba government to task its domestic violence Death Review Committee to investigate Sandi-Lynn’s murder, the circumstances that led up to it and issue a public report on its findings. my cousin and countless other women don’t deserve this treatment from men. This kind of behaviour stems from the home those men are raised in, its not that there aren’t enough resources, its the fact that they don’t want anything to do with these resources. That’s an interesting point of view. Can you elaborate a bit on what resources are available? I went to Ebb & Flow to work with the youth on a music video shortly after this happened, in 2010. One of my students was Sandi’s little sister. i was workshopping with 2 grade 8 classes. The one class was fine and happy and having fun working with the music equipment and the video cameras that i brought into the classroom from Winnipeg. the other class was very somber, very sad…it was clear to me that this event traumatized the kids…there have been suicides since then. i tried my best to cheer them up. but the kids are alone it seems. Thanks for posting this. Hard to imagine how such an awful crime couldn’t have an impact on the community — and that you say there were suicides is just horrible. What needs to change, do you think? Also reviewing how the RCMP deal with situations where there is violence. It is clearly outlined in this article that my cousins case was horribly overlooked by those in a position to provide her aid, even if nothing else but to buy her time by actively looking for the man who was assaulting her, and not leaving that reserve until he was apprehended! A shelter of sorts to provide a safe place for those who are needing to leave violent situations and providing resources like emergency housing, advocacy and mentoring for the abusers to learn positive and healthy behaviors. heartbreaking he prolly wont get long.my neice natasha moar was also killed by her boyfriend in crane river ,mb not far from this place.july 12 2009 and this boyfriend of hers only got 56 months.for taking a life can read her profile google natasha moar and you will see a article about everything he did to her.he totured her to death.i feel for this family that lost this young girl.these girls need justice and not thrown to the side and forgotten.like they did to my neice.she had no justice.i hope they review her file too.i pray for this family to get justice for this poor girl.